The South of South neighborhood has an unofficial mascot. You’re not going to see him hanging out at Citizens Bank Park with the Phillie Phanatic or the Wells Fargo Center with Franklin the Dog. This little fella is much smaller — as in stuffed animal smaller — but he is quickly becoming quite the conversation piece. 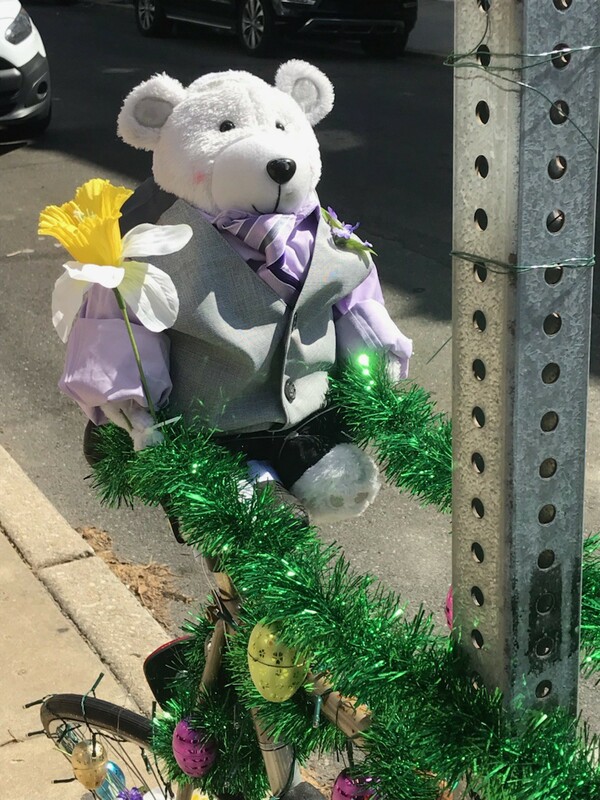 For the purpose of this story, Bear is his name, and he resides on an abandoned bike chained to a stop sign at the corner of 24th and Catharine streets. It’s not something residents typically see or hear about in South Philly, but he is quickly becoming the neighborhood’s most popular figure. The little guy is getting monthly makeovers that literally have drivers and fellow residents stopping to check out the new look. He is currently sporting his St. Patrick’s Day attire, complete with a shirt, shamrock pants, green beads around his wrist and a headband with two big shamrocks. Since unveiling him to the public in December, Bear, who seems to be worthy of a naming contest, has sported different looks for Christmas, New Year’s and Valentine’s Day. He is currently sporting his Easter Sunday best. “We are getting carried away with it, but it’s too much fun,” said Bear’s friend. Bear responded with a “no comment” when asked which look he has liked best. We had to ask. Bear seems to be making new friends every day. The irony of this story is Bear’s friend put in a request a couple years ago to have the abandoned bike picked up by the city. With a smashed back tire, it’s not like a person can hop on and take it for a ride. So over the summer, when a family member was visiting from outside the country, he suggested dressing it up and making something out of it. Bear’s friend said she thought it was a really good idea. Around Christmas time, when the family was putting out their holiday decorations, the idea finally clicked. 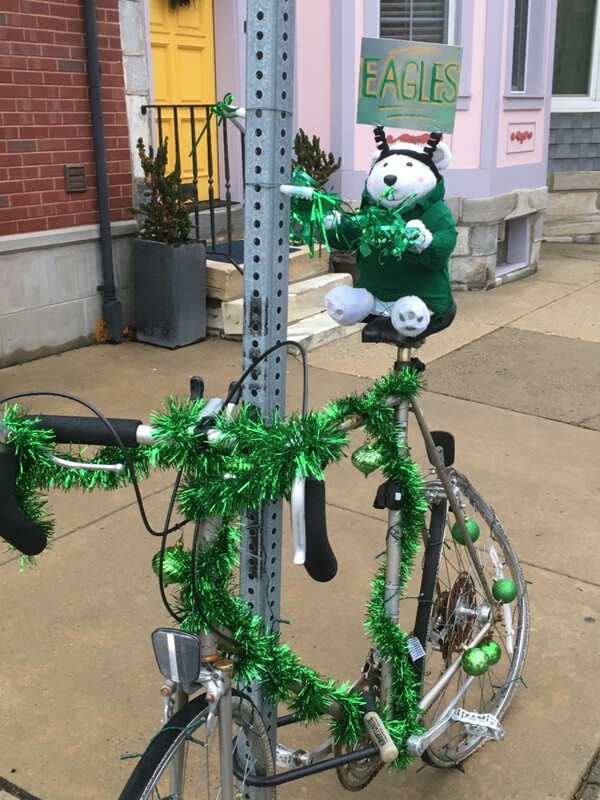 The bike got all decked out with Christmas decorations, and sitting on the seat was a little white bear sporting a red scarf and green sweater. “People were stopping by to look at. We got so many reactions,” she said. 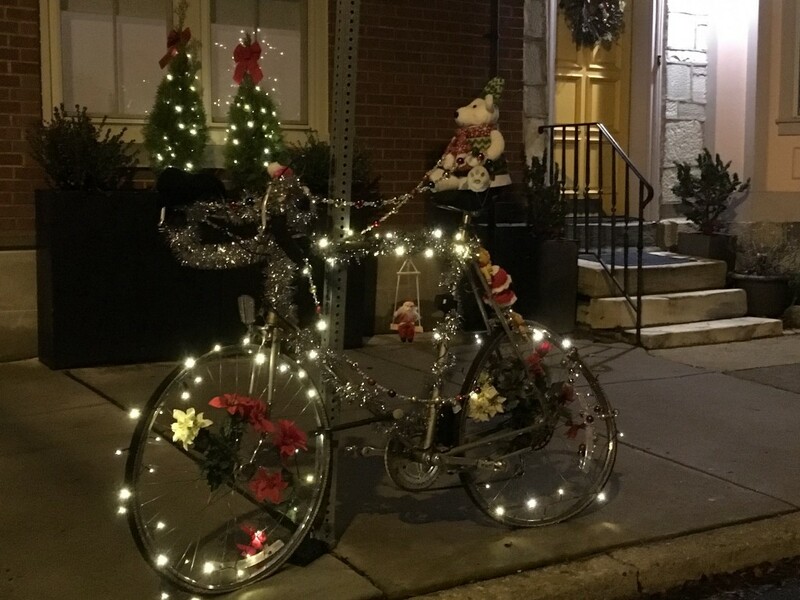 Being a friendly neighbor, the stylist checked with the person across the street to ask if it was OK to leave the Bear sitting on his bike. Sure enough, lights were added around the wheels and near the seat. Bear now has two caretakers who alternate months on overseeing the fashion decisions. 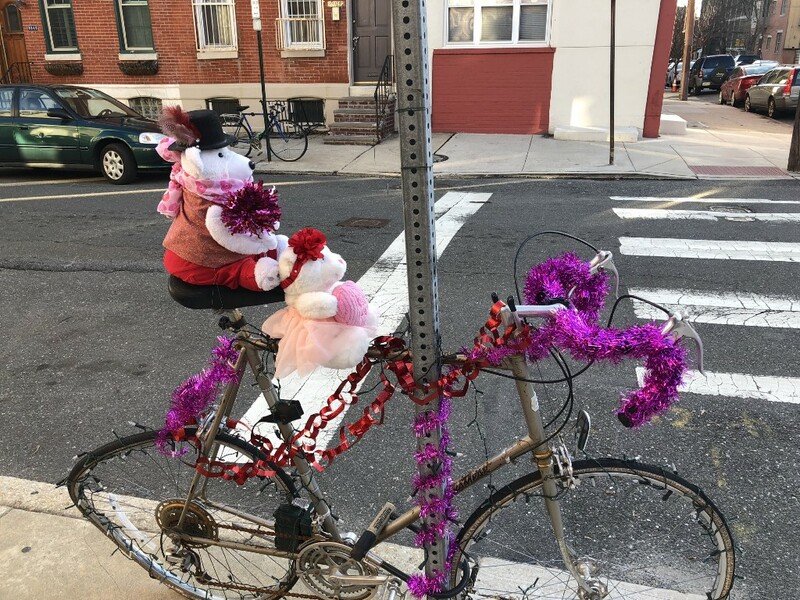 For Valentine’s Day, Bear picked up a date on his bike. Go figure. 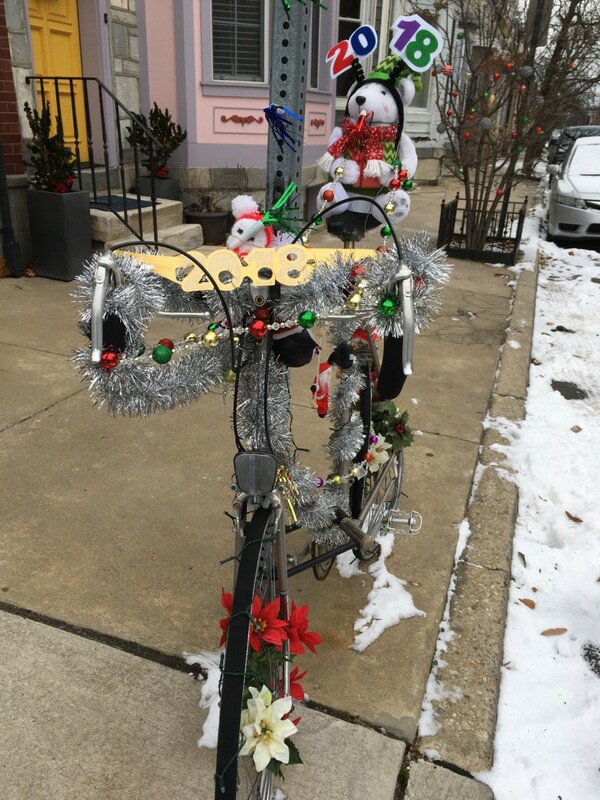 The red Christmas balls were kept out — at the recommendation of another one of Bear’s fans — so it would match the Valentine’s red in the bike. More recently, poor Bear has required some extra TLC as a result of the rain and snow. 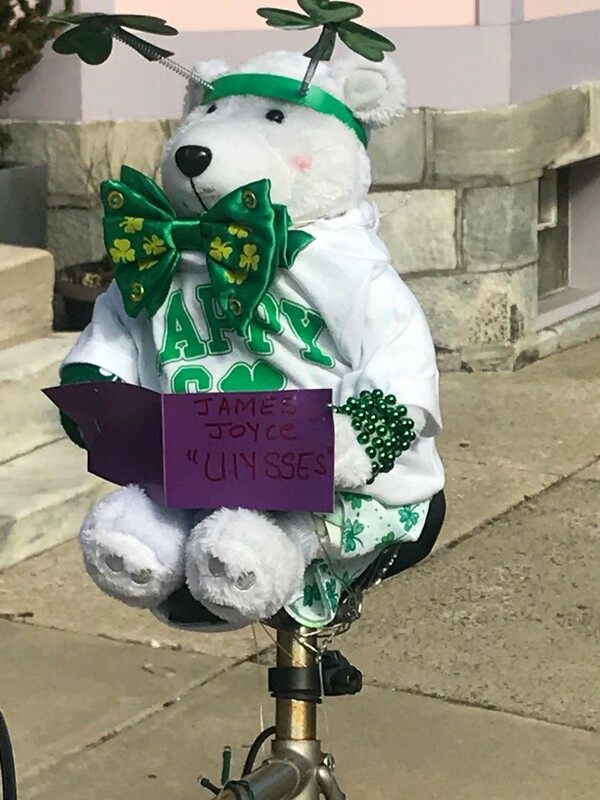 Bear’s friends are not revealing their identities for one simple reason: “It’s for the community.” Stop by — there is a stop sign after all — and you may spot one of them fixing Bear up for Easter.